First of all, I would like to thank (International peace federation), for organizing this gathering and to Discuss about refugees problem, the modern times problem. Jordan is one of the countries who has received and sheltered many waves of refugees. Starting In 1948, the first largest wave of hundreds of thousands of Palestinians, who were forced to leave their homeland due to the Israeli occupation, Of course, Jordan has been very generous to give all kind of relief including citizenship status, also, in 1967 war, another wave of 500 thousand Palestinians was forced to flee from the West Bank into Jordan again. In 1990: another 400 thousand Palestinians were deported from Kuwait. In 2011, the largest wave ever!! A one million and half Syrians flee into Jordan and due to this wave, Jordan public debt has risen from 22 billion US$ to35 billion US$ in four years. The unemployment ratio has gone to 18% ‘official rate”!! The pressure on the economy, the infra structure and the social life, has become unbearable in the lack of the international aid. AND NOW, please allow me to give you a live evidence of what it means to be a refugee!? My parents who were born and lived in Jaffa - Palestine, have no other alternative but to protect their family and leave their home and seek refuge like so many others .The family ended up living in a refugee camp in Zarka town, 25 KM north east of Amman, the capital of Jordan, where I was born, and I completed my high school at the UNRWA schools. Just imagine living in a camp with two water taps, four public toilets and one public shower bath, serving 15 thousand people!!! At that moment, I knew what it meant to be a refugee? It means literally, losing your humanity, your integrity your identity your dreams, your compass and directions. In this environment, refugees are exposed to all kind of misconduct, inhuman behaviors, violence, madness, and drugs, human trade, just name it. We are gathering today as peace lovers from all over the world, to help find solutions in an attempt to overcome the embodiments of peace .This is a great task to achieve by presenting applicable mechanism with a clear vision and path to implement. At this critical stage of the complexity of the international and regional interests and the complexities of harmony and disharmony between the international and regional political leaders and major transformations which takes place in the world and the policy of fragmentation and religious sectarian and ethnic ripping incursion extremist ideology and terrorist. Accordingly, I believe that the most effective way to address the refugee crisis is the occurrence of an international qualitative shift in how to deal with the refugee problem, not only in our region but everywhere in the world in which he talked of political events, economic or natural disasters lead to a humanitarian asylum. The issuance of bold political decisions to give the hope of a decent life for refugees and the implementation of development projects provide opportunities of life for refugees and help their host countries to shoulder any extensions of time to resolve the crisis. Contribution and support to solve this problem should be looked at; as a humanitarian right and NOT as charity, since our world became well interconnected. Yet, we can see the result all over the West. The impact on the EU to disintegrate and the latest UK exit; is live evidence. Governments should deal rationally with unofficial immigration. The role of the UN; must be activated away from any political interference. The human rights charter and the International Covenant on Civil and Political Rights must be applied to all without any kind of discrimination. Sheltering of refugee in temporary secured areas either inside their home country or outside and to provide them with all humanitarian aid until a time due to go back to where they come from. International community should offer and provide every possible help to those countries who really help refugees regain their humanity, integrity and homes. At last but not least, I do believe that we all have to provide every possible means to promote a sustainable peace, through religious pulpits, educational institutions and media, to create a peace culture, and eradicate all kind of oppression, terrorism and above all the war culture. Dr. Al Antaki is a Jordanian citizen. A graduate in medicine from Milan, Italy, he is a member of the Jordanian-Italian Medical Association Executive Committee. He chairs the Health Committee and is the Vice President of the Jordanian Red Crescent of Rusaifa municipality. An elected member of the UN Relief and Works Agency (UNRWA) Services Council, he heads the Advisory Committee Integrated Community Based Initiatives at the Suf Camp for Palestine Refugees. He chairs the Higher Coordination Committee supervising 10 community-based rehabilitation centres and 14 women’s programme centres under the umbrella of UNRWA. 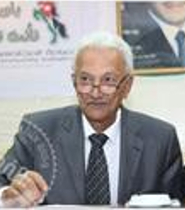 He is the Chair of the UNRWA Physicians Social Committee. ILC London - Dr. Mohammad Al Antaki, Secretary General, Integrated Community Based Initiatives Association, Jordan from UPF Europe on Vimeo.